Walking that fine line between creepy and cute! Goblinfish are 20 cm (8 in) long. They have great, big fishy pectoral fins and a great, big fishy dorsal fin, but their head is like a little box teetering on the edge of a shelf. It looks like their eyes are on one, huge stalk! And what lovely eyes they are. Vibrantly red with white stripes, they look like ornate beads resting in the sand. That's in no small part because the rest of the fish looks like a pile of sand. Goblinfish are masters of camouflage. They live in coral reefs and rocky areas off the coast of southern Australia where their haphazard, speckled colouration let's them melt into the background. They can even change colour to suit their particular surroundings. Goblinfish are active at night, when they go around munching on small crustaceans. They can swim if they really need to but they prefer to rest on the sea floor and drag themselves along with those giant pectoral fins. 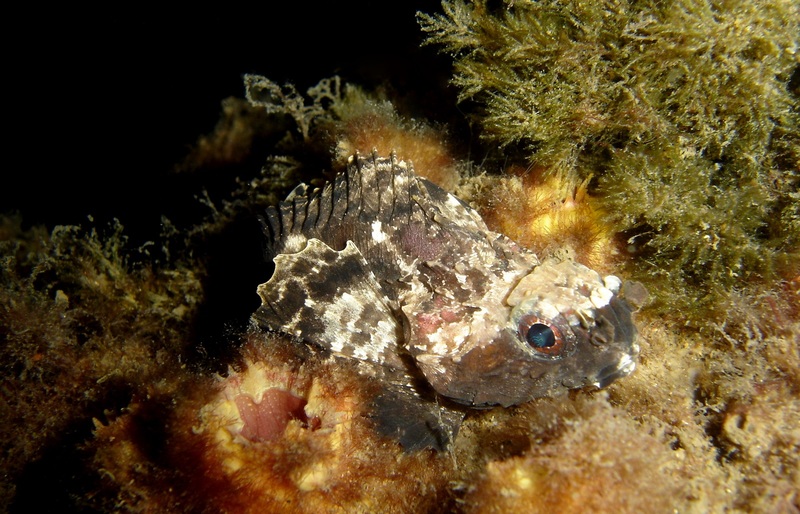 This is a common lifestyle among fish in the order Scorpaeniformes, from big angry Scorpionfish to cute little Grunt Sculpins. You know what else is common among Scorpaeniforms? VENOM! The Goblinfish's long dorsal fin is supported by spines armed with venom glands. It's not lethal to humans, but it is painful. Creepy, cute, camouflage and calamity... what a brew! I still need to kill about 10 of these to level up. Then I can start fighting orcfish. @Crunchy: Darn! I'm still on the trollfish grind! Most interesting! It looks like it was on it's way to becoming a turtle and changed it's mind. Wonder why! Yes! Someone else said it looks like a chameleon!